Twitter’s video sharing service, Vine, has hit the number one spot for free apps in the Apple App Store. As TechCrunch notes, this milestone comes just six months since it first debuted. It’s interesting to note that this top placement only extends to the US, not anywhere else in the world. However, Vine is the top social app in the US, Sweden, and Canada. For those that don’t know, Vine is a service similar to Viddy or Snapchat in that it allows anyone on iOS devices to record six second snippets of video to share on Twitter and Facebook. 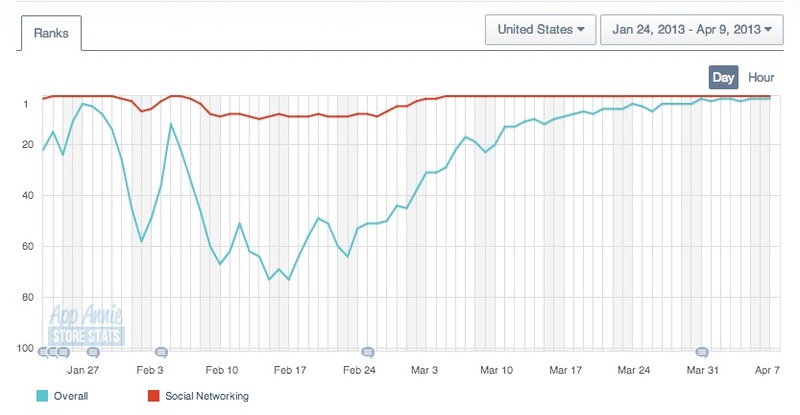 In the App Annie-provided graph below, Vine’s rise to number one has been more erratic when it comes to it’s overall ranking while the red line is for social. Both the free and social categories are notable because they are two that people most commonly relate to it. However, Vine is featured in 171 places in the Apple App Store. Vine’s Creative Director and co-founder Rus Yusupov sent out a Tweet earlier today to officially make the announcement. The past half-year have surely been rather busy for Vine. While Twitter launched it this past January, the company had been around months before then. The deal happened in October 2012 for an undisclosed amount. Soon after, the service was temporarily booted from the App Store because of its mature imagery and when it returned, Apple slapped a 17+ age rating. In the past month or so, Vine has added some new features, which most likely helped to propel its usage. At the end of last month, Vine made it possible for users to utilize Web embeds and the ability to share other people’s videos through Twitter and Facebook. And just last week, it unveiled a trending hashtag section that users can review for hot and rising topics. Vine has also help spawn a whole new ecosystem and interesting videos. Dwolla Developer Evangelist Michael Schonfeld created a service soon after Vine’s launch that enabled anyone to share the six-second videos to Tumblr or any other type of blog. And of course, we must not forget that the teaser trailer for the upcoming comic book film “The Wolverine” was released in Vine format.